right between two doors that lead out of the house. I wish I could take credit for making the coat hanger. and gave it to us for Christmas a few years ago. and used reclaimed wood from an old fence. Love the fork coat hanger! Brilliant! That is awesome!!!!! I love it!!! Love this idea of the forks as hangers! Especially since it is near the kitchen. Too cute! Thanks for your lovely comment on the twinkies birthday party. We all had an excellent time! Absolutely adorable!!! I am adding this to my idea notebook! Gosh you have the most awesome things. I just bought one from Home Depot a few weeks ago and if only I would have seen this earlier I could have saved me some bucks...but oh well I guess I could make some for Christmas prezzies....so darn cute! Really cute and what a great way to be GREEN. Very neat and resourceful, I must say! Thanks for sharing! Could that be any cuter! I have a sterling silver spoon pen and bracelet! I love it...I always do with u! but I want to post it properly tomorrow with a link back to you. I just wanted to let you know so you won't think I would just use your cute idea and not give you credit. I love all your awesome ideas! Oh how cute...so your whole family is crafty heh?!? Love it!!! I'm just frantic running around trying to take in all the posts that I missed the last week. YEEEKS I'll never catch up. I love the fork hangers but my favorite post was the "fall" sign. You always come up with the greatest ideas!!! And I discovered I gotta have my JOY fix everyday! That's a great idea! Are the forks very sturdy or is it more for hanging up really light items..like keys? what a fun idea...great way to use things you already have, love that! How cute! Thanks for the great ideas, keep them coming! If I believbed in re-incarnation I would want to be you in my next life. You have an amazing imagintion. Twilight book lovers would eat this thing up. That is so cute! 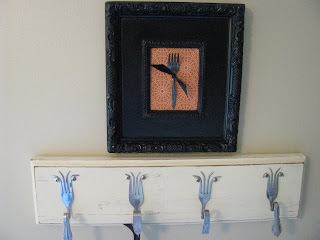 I love the little fork in the huge black frame! Hi there Joy, I put a post with a link to your blog letting others know about your ideas. Thanks for letting me know the real McCoy when it came to copying the craft. Take care. Cute and I love your title! Very creative! Pretty cool! That is one cute gift idea. Love, love, love your site! I've been lurking for a while, and am so impressed with all the great ideas you have! I should also mention that you've inspired me to give a few things in my home a facelift with black spray paint. Which brings me to my question. I bought a great dining room set (table, six chairs, buffet, and hutch) off Craigslist last year. It's wood in a honey color, but when I bought it I had every intention of painting it black - just didn't know how. What would you suggest? Obviously the table especially will be used every day so however I do it will need to be able to take some wear and tear. What would you do? Appreciate your advice! Thanks! That is very cute. I have seen that before, but only single ones, not like a rack. Your pic is cute too! I love both of those pieces. I may have to "frame" some forks or spoons. 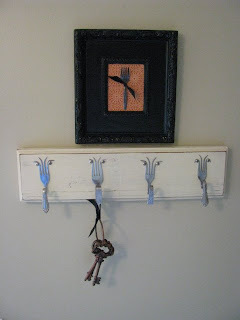 I did use forks as shelf brackets awhile back. That was fun! Wow! They are both precious... I bet that greatness of decorating just runs in the family! Great idea with painting the moss brown...hmmmm! That is a great idea! Thanks for posting...very original and creative! I'm in love with it. Really. I'm thinking Christmas already, and this is a perfect idea. Your little framed fork above it is perfect! Hi! I have a question about painting on metal...I just purchased a antique brass chandelier at a garage sale. I was inspired to paint it black like the lamp base you painted recently. Is there anything I need to do special with the surface prior to painting it? What paint do you recommend I use? Any information would be most helpful & much appreciated! You can email me at jjbiederman@mchsi.com. That is soooo adorable. I'd like to make something like that, hide the silverware, or use it all then maybe I wouldn't have to cook and we could all eat out!!! I really like that idea! Joy you have brought 'Joy'!!!! Wow! I guess talent for making such creative things must run in your family! Love both the "picture" and the coat rack. Great ideas! I finally got around to making one of your five minute projects which I posted tonight. Love it....you nearly forced me to go to Goodwill and find forks. When I move I am going to have to do this! That is so pretty - love the idea of using forks! Thanks for visiting my blog and your comments about cake decorating. Aren't the classes a blast? Our instructor did tell us the pudding trick though I haven't used it yet...I will soon though! Thanks again! I've added your blog to my blogroll:) LOVE your site! Very cute...I love old silverware! ANOTHER fabulous idea. I'm telling you that you have the cutest ideas ever!!!! Such a cute idea! That would be a cute way to hang mugs in my kitchen! So innovative! It is really a cute idea. Can you actually ues it to hange things on?